I’m loving this “Fall-like” weather we’ve had recently in San Diego. It has made running in the morning a lot more enjoyable. Last week while my husband and I are were out at one of our favorite running spots, we encountered one of the local high school cross country teams. I think just seeing the kids out practicing put a pep in both of our steps. We both ran cross country in high school and college and just seeing the young runners float by made me miss those glory days. I remember when I liked running so hard it made me want to vomit. I ran through illnesses and injuries and pushed myself further than I probably should. If you told me it would be difficult or even impossible to accomplish, I’d be sure to prove you wrong. These days I run as fast as a snail and the slightest ache or pain has me making excuses. Having a running group to lean on has been so helpful and motivating, but more on that in a bit. Running is a great time to reflect on your day, your week, or even your life. During this particular run I was thinking back on how fit and fast I used to be. I remember all the cute running shorts I used to have. Now I wouldn’t dare try to run in a pair of “booty” shorts. My poor thunder thighs would be so chaffed. 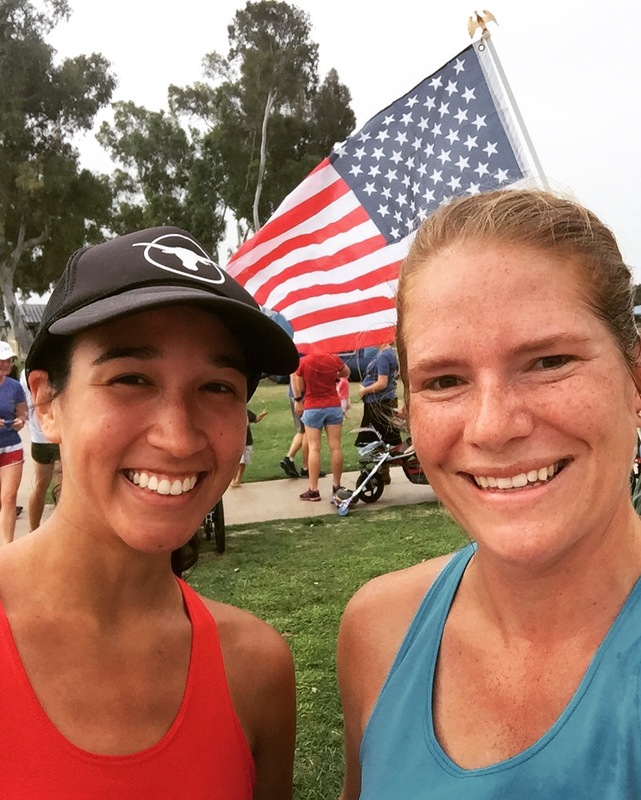 After the third time the high school girls sprinted by me in their short shorts and sports bras, I stopped feeling bad about my current abilities and rather started feeling proud as I looked back on all that I’ve accomplished and all that I plan to do. I was out there on the same path, in the early morning, pushing a stroller and battling morning sickness with every stride. “These girls got nothing on me!” It has been amazing to watch my body change over the years through age, pregnancy, and child birth. I thought having a baby would slow me down and keep me from running, but it has really done the opposite. Since my baby was born 9 months ago I have completed a 10K, several 5Ks, a 4 Miler over a bridge, and a Half Marathon. I feel like I’ve been comparing myself to younger girls my whole life and it really needs to stop. I will never forget my high school cross country coach, Mr. Reynolds, telling me the two reasons I would not make “All-State” my Senior year: 1) I was not one of the fastest high school runners in the state and 2) they were allowing middle schoolers to compete and from an anatomy stand point these girls were at an advantage because they hadn’t fully gone through puberty and their hips weren’t as wide as mine. I was shocked! I never expected him to actually tell me I did not have a chance, much less use my body shape to make his point. I realize now, after a few Google searches, that Mr. Reynolds wasn’t as full of bologna as I had believed. It’s known as the “obstetrics dilemma”: humans give birth to ginormous babies (compared to other species) and childbirth is easier for woman with much wider hips, but Anthropologists have believed for some time now that wide enough hips for childbirth is bad for bipedalism. However, a recent study by Kristi Lewton and her team at Boston University found no connection at all between hip width and efficiency: wide-hipped runners moved just as well as their narrow-hipped peers (you can find the full article here). I found this out for myself in 2004 when I shocked the hell out of Mr. Reynolds by beating the narrow-hipped middle schoolers, making the “All-State” team, and running my fastest 5K time ever, wide hips and all! I’ve long since worried about my speed while running. I mostly focus now on my endurance and running long distances. I love seeing how far I can actually run. I have completed a few ultramarathons and would love to do more in the future. When I lived in Maryland I ran with an ultra trail group called the Frederick Steeplechasers. I’ve never met a group that loved running as much as they do. My husband and I were half the age of most of the runners and they could kick our butts on any given day. Some of these folks are running faster and farther in their 50s and 60s than they ever did in their 20s. It is amazing and encouraging to see such endurance and passion in other runners who are more senior. I can’t wait to see what I’m capable of at their age. I guess my point to all this rambling is this: I sure do miss running the way I did in high school, but when it comes to running, my glory days are not behind me. I plan on running many, many more miles with my wide hips, thunder thighs, and babies in tow. Running is just one of those things you can do at any point in your life and with a little bit of training you might not be too bad at it.